Price is oscillating within a tight $80 range marked by 12.10.2017 doji candlestick. By any standard, bull price rejection happens around $330 to $340 which is a resistance confluence zone marked by the resistance trend line-that between 24.09.2017 and 12.10.2017 highs and the support turned resistance drawn from 14.09.2017 and 05.10.2017 lows. 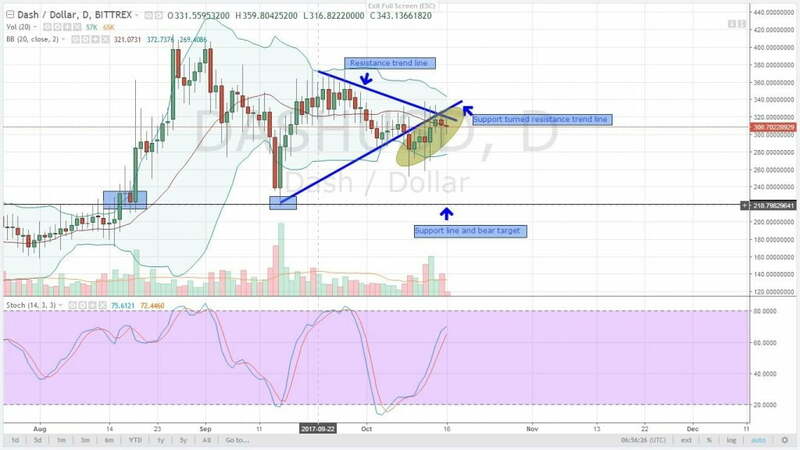 My recommendation is patience until there is a break above $340 for bull entry or if in case that resistance trend line stands and the bear trend continues, sellers should join in below $250 which is a safe entry zone. Either way, there is a buy signal in place but these whipsaws and dojis give mix signals which is not beneficial for trend traders. We remain neutral as we watch stochastics and volume behavior to predict the most probable trend direction. 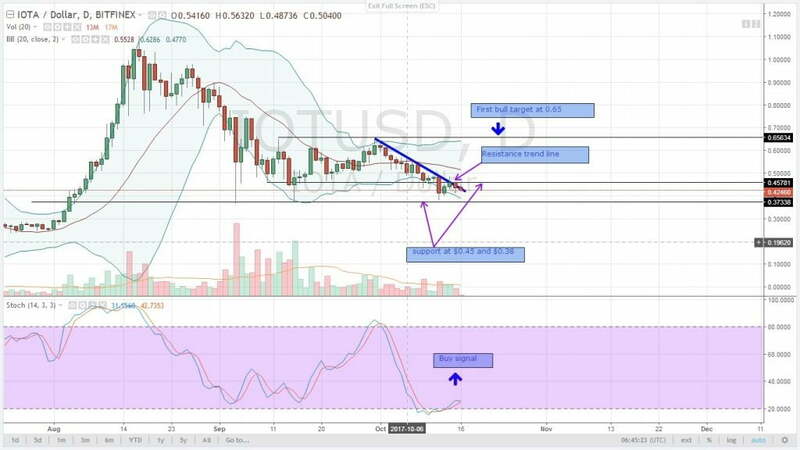 Buy momentum is sustained as shown by stochastics and on another level, the resistance trend line managed to rebuff any price appreciation above $0.45. On these three days when prices were constricted within a tight $0.10 range defined from 12.10.2017 Hi-Los, volumes remained tepid and on a negative trajectory after recording a record 19M. The 19M surge in bear volumes was the force behind that bear candlestick which closed below $0.45. Following my Saturday’s recommendation, bull trigger happens when there is a break above $0.48 highs of 12.10.2017 and a consequent break above 30.09.2017 and 12.10.2017 resistance trend line. Important bear levels remain at $0.38 which is 04.09.2017, 15.09.2017 and 12.10.2017 support levels. There was a brief price appreciation on Saturday before a correction on Sunday. For the record, price tested 23.08.2017, 15.09.2017 and 27.09.2017 highs of $102. That level is turning out to be significant for bulls. In the meantime though, correction towards the support trend line or the 20 period moving average around $86 to $95 provides a wonderful opportunity for bulls to buy at a cheap and aim for that resistance level at $122 as long as there is a buy signal and increasing momentum. Also, notice how volumes have been sustained above 25K daily average in the past 3 days. There is obvious supply-demand push and pull at these current price levels. 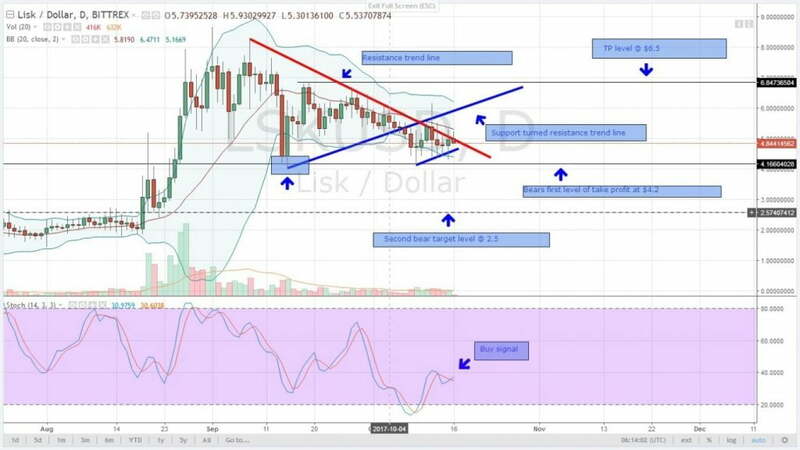 Despite across the board bull pressure in most alt-coins, USD bulls are pushing LSK down. 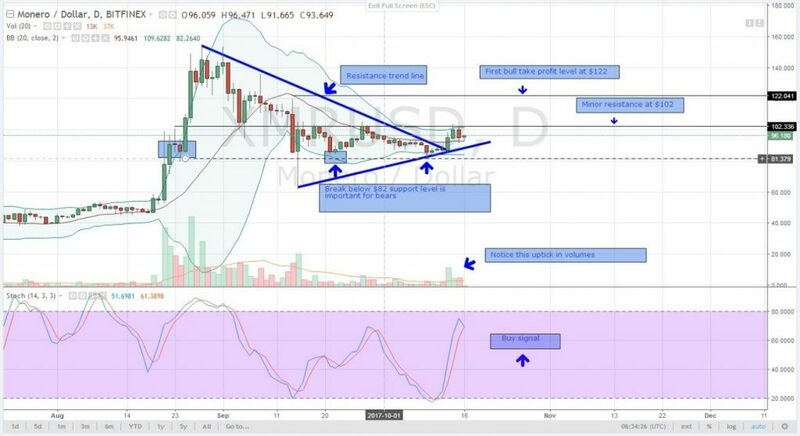 On Saturday, we mentioned that as long as prices remain below that resistance trend line then we remain bears until when there is a clear push above. That should be accompanied by a strong bullish engulfing pattern or a two-bar reversal pattern. In this case, though, price action remains within 12.10.2017 Hi-Los and that minor support trend line connecting 09.10.2017 and 14.10.2017 lows still holds. 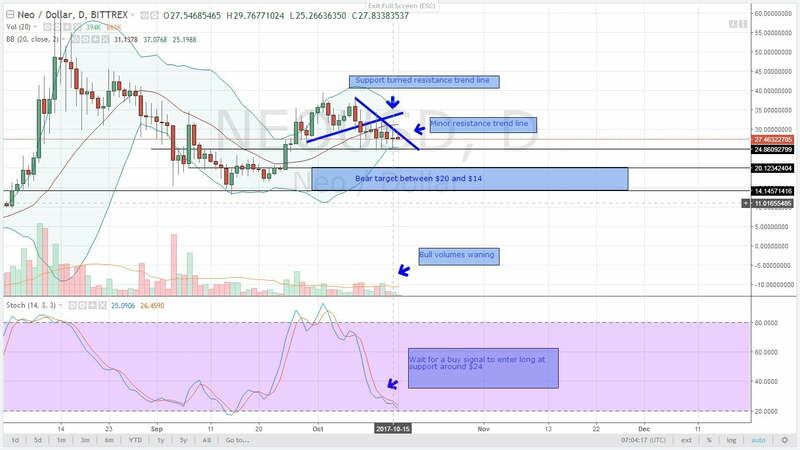 There is a buy signal but bear volumes are still below the daily average trading range and therefore, today’s candlestick can lead to a break above resistance or below minor support for bear trend continuation. We remain neutral for now until a clear trend is defined.